A traditional Chinese massage is a treatment for the body. But who is the best masseur at the beach? 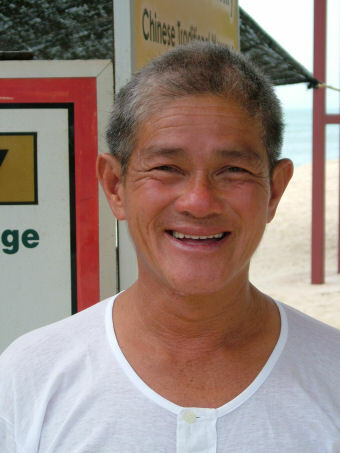 I'm coming since 1988 on the island of Penang and I have found the best masseur after all those years. I've seen many masseurs come and go, but Foo is still here after all those years. He's there since the beginning of my arrival at the beach of Batu Ferringhi. It's always busy and mostly you'll have to make an appointment for your message. 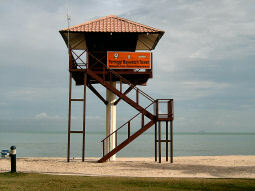 You'll find Foo at the beach near the Golden Sands, where the Bay Watch Towers is looking over the sea. Foo works with his family: his son Tommy and his wife Amy. They will give you very good massage. 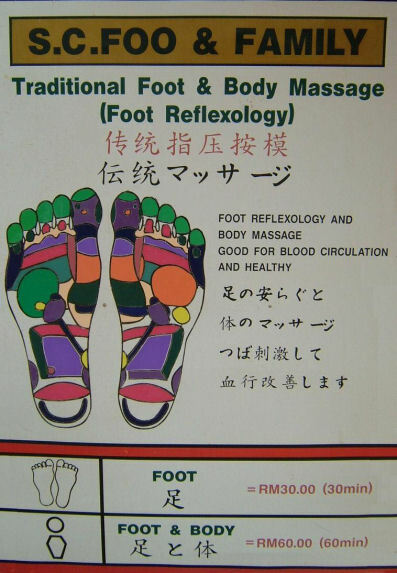 You can choose between a foot reflexology or a body massage. While he's busy massaging you he'll tell you everything about your body: your liver is ok (or not), your kidneys are ok (or not) etc. The first time I was treated by Foo I had an awful pain in my back. He advised me to come every day for just 10 minutes. So I came back everyday for a week. And really... that treatment cured my back. At the right you'll find the fee he charges you for one hour. It's not much. Don't go to the reflexologists next to Foo. They are leaving the beach early, have no experience and don't have much customers. Probably they are there for the first year and don't have the experience which Foo has. The best way to do: ask Foo when he has time for your massage and that's the time!! You don't need towels or so! Simply re-charge your batteries with a rejuvenating massage treatment. Tell Foo about me and you'll hear a lot about my coming to Penang for 32 years. family business (father, sun, daughter in law) and special "the old Foo" is doing a great job. We did experience this more than 28 years and if you mention my name you will know more about me! Please, take a print of this page to Foo and Family.